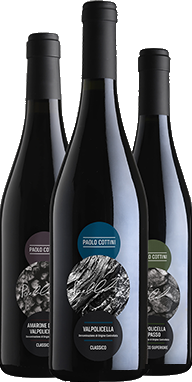 I was recently contacted by Paolo Cottini, whose eponymous estate is located in the heart of Valpolicella, in Castelrotto, a small medieval village located at the top of a hill. Paolo’s wines are not currently distributed in the UK (though they have a strong presence in most other European countries, South Korea, China and Australia), and asked if I would be prepared to taste them. Subsequently, the three wines below arrived. Paolo’s winery is new, but he is the third generation of winemakers, his father Silvano passing on his knowledge. Grapes grown are the typical triumverate of this region: Corvina, Corvinone and Rondinella, and he produces four classic appellations: Soave (not tasted) and the red wines Valpolicella Classico, Valpolicella Ripasso and Amarone. It’s a neat summary of Valpolicella: at the top of the Pyramid is Amarone, famously made from air-dried grapes as a rich and powerful red wine of 15.5% alcohol or more. At the base is Valpolicella, made from freshly picked grapes and, in the middle, comes Valpolicella Ripasso: the wine fermented from fresh grapes but on a deep layer of dried skins from the fermented Amarone grapes. Paolo’s web site is at paolocottini.it. (2016) A classic blend of the three main Valpolicalla grapes, Corvina, Corvinone and Rondinella, this dark and youthful wine has cherry and blackcurrant aromas, a touch of sweet tobacco-spiced plum too. On the palate this is quite a grippy, vinous wine, the dark vine fruits set against nicely grainy tannins, and the bright acidity that typifies Northern Italian reds present and correct. There's a warmth on the finish too, in a most enjoyable and classy Valpolicella. (2016) This is the middle-ground wine, fermented on the dried skins of the Amarone grapes, and the same grape blend. It has something of the red liquorice and kirsch lift of the Amarone, a touch of spicy tobacco and a nicely solid, black fruit ripeness. In the mouth this is super-smooth, creamy stuff that is suffused with rich berry flavour, but that hint of tobacco and toast, and the edge that grips with liquorice and tart plum skins is delicious. A really enjoyable wine - exuberant and yet darkly-hued and firm. (2016) A typically bruising 15.5% abv for this Amarone, made from partially dried Corvina, Corvinone and Rondinella grapes laid out to partially dry for 90-110 days before fermentation and aged in French oak barriques. Lovely kirsch and red liquorice lift, elegant flower notes and masses of red fruit, onto the palate, a smooth cocoa and mocha character underpins the fruit, intense sweetness of cherry and blackberry very nicely balanced by creamy oak, tight and smooth tannins and plenty of tangy acidity. It's a characterful wine that would be wonderful with some venison for example.